We are fortunate that Alice wrote her own life story. I [Alice Christine Eggleston Richard Tourigny] was born Nov. 20, 1914 in Grovont Wyoming. Grovont is east of Jackson Hole and at the feet of the Grand Teton Mountains. I was born at home by Dr. C. W. Huff. As our winters came early and cold, I imagine the ground was covered with snow. My parents were Joseph Smith Eggleston and Talitha Cuma Cheney. They were married in the Salt Lake Temple Jan 15, 1914. They traveled to Salt Lake City from Jackson in a sleigh and a team of horses. As I can remember they were a matched grey and white team. 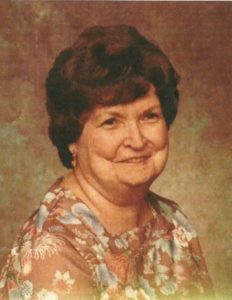 Mother was always active in the church, she had a strong testimony and love for the Gospel. I think she was as near to a lady as any woman could be. Her language was correct and she used no profanity. She was a good example for her children. She did not send us off to church she took us and made sure we behaved. In the Ward in Grovont, where she started her married life, she was Relief Society President, she played the piano and could lead the congregation when necessary. Daddy was Sunday School President. I think Dad had a testimony not always as strong as Mother’s. He was honest as could be and set a good example for us, he had no tolerance for liars. His word was good, he never made a promise he could not keep. He was a punctual man, if he said we leave at 9:30 for a 10:00 meeting you better be ready or you got left. When they settled in Grovont, one room in the house was the Post Office. They ran the Post Office for several years. 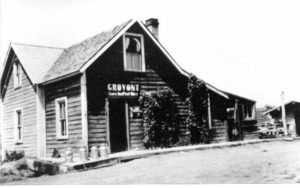 This was probably the home with the sign for the Grovont Post Office. The Church was right across the street from us. My Dad’s Uncle Jake Johnson and his family lived next door to us. I doted on my cousin Marie, she was quite a bit older than me but she gave me a lot of attention. I can remember so many times sitting on the Church steps with her talking with me. The May family lived on one side of us and the Moulton’s on the other side. Veda May was a little older than me and Melba Moulton was the same age. Mother kept me close when I was a toddler and I can remember being in the Post Office while she took care of the mail. On was days I was with her while she hung the clothes out to dry. I like all children, liked to play in the mud. I remember making mud pies while she was busy. One day I decided some eggs would be nice in my mud pie so I took some out from under a hen. I don’t remember how many, but when mother found out she was upset because the hen was setting on them to hatch them, she was just starting so the chicks were not yet formed. A Mrs. Chambers, another neighbor, visited with mother. I liked her, she always made a fuss over me. She did not have any children. I liked going over to her house. She had two big dolls, one a boy the other a girl. She would let me play with them. One day, while she and mother were visiting, I decided the boy needed to go to the toilet. Those days it was out doors, a small building placed over a big whole in the ground. They had a bench type seat which usually had two holes you sat on. I got the doll’s pants off, then I could not get them back on. So being afraid to tell I just left the doll in the toilet. Later Mother and Mrs. Chambers tried to get me to tell where the dolls was. I was afraid so I didn’t tell. Later I heard her tell mother where she found the doll. 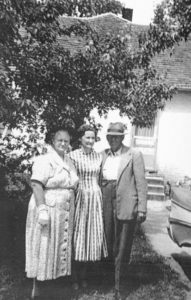 I guess I must have been 4 or 5 when I got acquainted with Veda and Melba and was allowed to visit with them. We had become good friends by the time we moved away. We kept touch with each other for a while. The winters in that country were severe. I can remember when the snow reached our second story windows. Dad shoveled a trench to get out to the barn. One time he had hitched the team and the sank in the snow almost burying them. He had to shovel them out. Mother had four of her children in Grovont, Me, Wesley, Lola and Orland. When they were preparing the bed and room for mother when Orland was due, Wesley and I were curious about what was going on. They had thrown the covers over the foot of the bed so we crawled there to hide. But we were discovered and quickly ejected from the premises. I was about 5 going on six when Dad sold the home and moved us to Eden, Utah. He was born in Eden, so it was like going home for him. Laura was born Nov. 20, 1920 on my 6th birthday, Melvin, Dale and DeLoss were born in Eden. When Orland was born she had some tearing as he was a big baby. Born before the Doctor arrived and he did not do any repairing. When Dale came along he was a 10 pounder and some more damage was done. They took her to the hospital and did what could be done at that time. She still needed more 13 months later when DeLoss came along. She was in the Hospital with him. She still needed more repair, money being scarce and debts still hanging over them, she kept putting off the surgery she needed. She went without many things for her children. She told me she wanted to live long enough to get her children raised. I started School when I was seven. There were six of us that started together, Myself, David Ferrin, David Burnett, Mary Clark, and Velma Fuller. There were others that came and went along the way but we six graduated from High School together. I always liked going to Sacrament Meetings, when I was a teenager, but I did not enjoy Sunday School. The teachers never seemed to get control of the class, as a result it was hard to get anything out of the lesson. I always remember Pres. McKay when he was on the High Council he would come to talk. I enjoyed him. He always shook hands with everyone especially the children. He has always been special to me. When I was a teenager we had Saturday night dances. I enjoyed them. I was 16 before I was allowed to date. I had some nice boy friends. When I was 17, I took a Mother’s helper job in Ogden with the Mathais family tending two boys. I was there two years. The last of my 12th grade I lived with the Judd’s, they had two boys and a baby girl. After graduating I went to work for Dr. Wikstrom. They had two boys. He was the family Doctor. I was there four years. My friend Martha Lindsay had a sister in California. Martha decided to go live with her and wanted me to go with her. I had been having a lot of trouble with my stomach. It got so bad Dr. checked me and said it was my appendix. I could go on indefinitely or I could have an acute attack. So I did not want to go so far from home with that hanging over me. So I had the surgery. Dr. made arrangements with the Hospital so I could pay them on time and he did not charge me anything. Meantime Martha’s sister got married and was expecting. She wrote me saying she was going to stay with Margaret when the baby come and that I could have her job if I came down. So as soon as I was recovered and had things in order I made arrangements to go. Mother was rather anxious as she was concerned about my health. I had grown up with one problem or another. I had Rheumatic fever when I was 11 or 12 and was always anemic. But I was excited about new horizons. I arrived in Los Angeles March 1936, took her place in Beverly Hills with the Turits Family, they had a 5 year old girl and a 12 month girl. Martha was with me a couple of days before she left. Margaret lived out in the San Fernando Valley. It was lonely for a while, everything strange and the weather was rainy. I thought where is sunny Calif. Then I took the flu and landed in bed, boy what a deal, I worried for fear I would be sent home sick. Mrs. Turits came in and talked to me and said they would see me thought if I’d stay with them. After two weeks I was on my feet again. 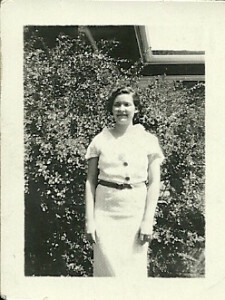 Martha and her boy friend Lynn Young had been going to a dance every wed., that was our day off. So I went with Lynn to the dance. Then I met a couple, Jim and Johnny Hurst, that she was friends with. One afternoon while I was visiting the Hurst’s a friend of theirs stopped in, Leon Richard. When I got ready to leave he asked if he could take me home. I told him where I lived and he said it was on his way. He wanted to see me again, he too me to a different ball room dance, he did not like to dance and as a result we stepped all over each other. That was the end of dances for us. I was getting tired of this job and thinking of looking for something else. After we had gone out for a few weeks Leon said, “You know what I’d like for Christmas?” Of course I said “What?”. He said “You.” Another week or so I thought why wait till Christmas and suggested my birthday. 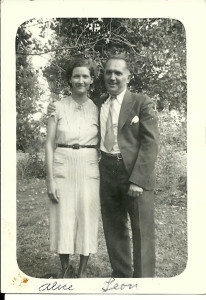 So we were married Nov 20, 1936. I wondered what I was getting myself into but everyone who knew him told me what a good man he was. It turned out to be great. He was so good to me. Working the way I did I had not found a Ward to attend. When Fred arrived I realized it was time I got back to Church. Leon was not a member, but did not object to be going to Church. He was raised a strict Catholic. He had been divorced 13 years when I met him and did not go to Church. When I asked if I could have the baby blessed he consented but asked not to baptize him. I explained that it is just a blessing when we name the baby. He felt that we should let him wait till he was grown and allow him to choose the Church he wanted. Since he allowed me to take him to Church I did not make a fuss. We bought a home in El Monte and that was the first Ward I became active in. We moved to El Monte in 1940. In 1942 the War started. First Melvin joined the Marines, Dale joined the Army. When Fred was 3 years old, I received a call from Laura telling me Mother had gone to the Hospital for surgery and thought I should come home. All these years she has put it off until the Dr. told her it needed to be done or she would be in a wheel chair. I arrived in Ogden Sun. Morning Nov 2. We saw her Sun. afternoon. She was very ill. Mon. morning when Dad come back from visiting her he asked in any of us had called her brothers. He was worried because she had pneumonia in both lungs. So we called Uncle Fleming. She was concerned about voting on Tuesday. I don’t think any thing was done about it. She died Tues. night. It is a blow loosing a mother. As I lived so far away it made it easier but I did miss her letters so much. The Dr. told me if he had known the condition she was in he would never have opened her up. Since, I’ve wished I had asked more questions, as I believer she must have had cancer. Leon had Asthma all his life. I had known people that had it but I had never seen anyone in an attack so it was a shock for me to see how he suffered. Fred started school when he was 6 and in his second year he had rheumatic fever. I had to keep him home and in bed for a year. His tonsils were bad, but at that time they did not take them out until after 4 years old. I had a home teacher for him. When he went back to school he was at the top of the class. 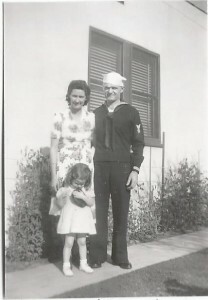 On June 24, 1942 my beautiful daughter arrived. The Lord blessed me with two beautiful special spirits. They have blessed my life so much. About the time Claudia was born Leon’s health worsened and he started having heart attacks. He had trouble breathing from all the Asthma. 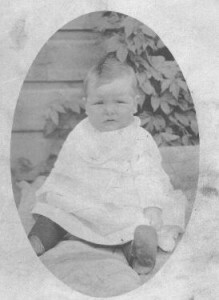 The first part of June 1945 he went into heart failure and passed away June 25, 1945. Claudia was 2, just the age she could run to greet him when he came home. Fred was 8 years old. As his birthday was nearing the Bishop asked about baptizing him. As all the responsibility was now mine I said yes. Leon had never taken him to Church and had left it all to me so that was the Church Fred knew. I met Joseph Z. Tourigny somewhere around Nov or Dec. We dated several months, most of the time we had the children with us. He loved the children and got along with them. We married Sept. 13, 1946. I gave it a lot of thought. I wanted to establish a settled home for the children. He was a good father. Fred finished High School then we sent him to the BYU. He did 2 years then decided to join the Navy. After 4 years back home he finished College at Cal. Poly. He married Ruth B. in ’60 so he did his last 2 years after he married and had Michael. Claudia graduated High School one week end and was married the next one, June 23, 1960, she was 18 June 24, 1960. Fred went to work for Control Data, a computer company, and has traveled all across the country for them. He was then living in Maryland. He had 3 boys and one girl. His oldest son, my first grandchild, served an 18 month mission to Switzerland. Claudia married an industrial engineer, and lives here in Glendora. She has 2 girls and 2 boys. Joe Tourigny was getting tired of his job, I guess what I should say is that his job was getting harder. He worked for U. S. Rubber in the mill room and had to do a lot of lifting rubber. So he decided to take an early retirement. It meant less Social Security payments, but it seemed the thing to do. His health went down hill fast. He started having angina attacks. Then went into heart failure. This lasted about 6 months. My husband Joseph Tourigny died July 14, 1972 with heart failure. The day after the funeral the children said “Now Mother,” I said “Yes. All these years because I married out of the Church I could not go to the Temple. It was understood that if I did not get my endowments while I lived they would have to take care of it. Now I could do it. Thanksgiving Nov 1972, Fred and Ruth came down and Saturday morning we all went to the Temple. I got my endowments then Fred knelt for his father for me to be sealed to him, then Richard knelt for Leon while the children were sealed to us. I pray he will accept this on the other side, then we will be a family there. In 1973 I had a slight stroke, it affected my speech and I could not write. It took a little over a year to recover. Richard had been taking care of my yard and anything that needed to be done. It was getting to be too much and Claudie wanted me to be closer to her. It was 17 miles one way for them to come to me. In 1978 because of my health I had to give up my lovely home. I am now living in a mobile home near my daughter. I enjoy her and her family. I try to go back to Maryland at least once a year to visit Fred and his lovely family. Now I fly when I go back to Maryland. I had a great trip to Hawaii in 1973. I have been active in the L. D. S. Church, spent 10 years teaching and counselor in Primary, about 6 years in Mutual teaching. Then counselor and homemaking leader in Relief Society and on the Stake RElief Society Board. Now I work every Wed. in the Los Angeles Temple as an Ordinance worker. I enjoy my 2 children and their mates and my 8 grandchildren very much. I do a lot of crocheting, love to trave. I have always done a lot of handwork, flower arranging and gardening. When I came to Glendora, I did not feel I could live in an apartment so I bought a mobile home. When I came here the Stake Pres. Raymond asked me how I would like to work in the Temple. I told him I would love to. I started in March 13, 1982. In 2001 I am still working there and love being in the Temple. 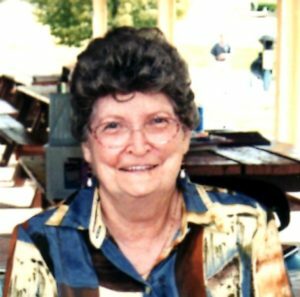 Alice passed away March 21, 2012 at age 97. She is buried in Rose Hills Memorial Park in Whittier, California. This entry was posted in Biographies, Joe & Cuma family and tagged California, Eggleston, Richard, Tourigny, Utah, Wyoming. Bookmark the permalink.